I love single portion sized foods because yes, I can definitely struggle with portion control at times. Can you relate?! I’ve found that if I don’t even have to think about it or take the option off the table all together, problem solved! 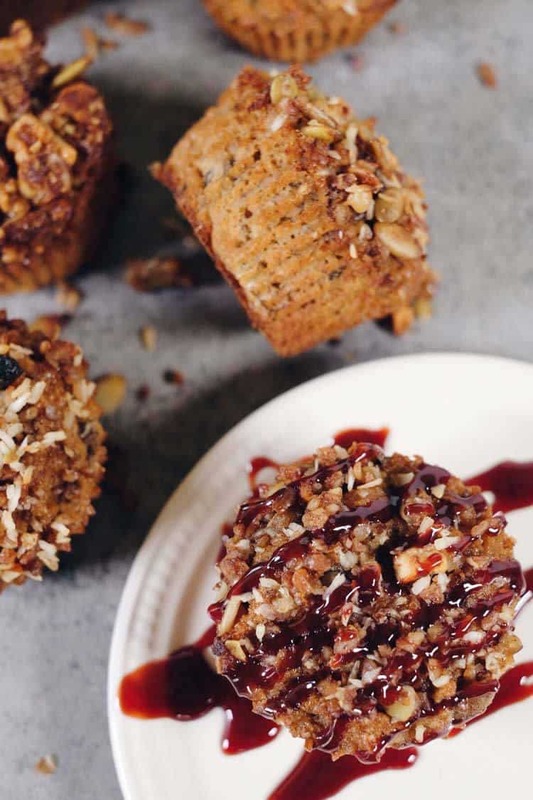 These crumbly topped Paleo banana muffins are the perfect snack or treat that I can grab and go and know that it is enough to feel satiated, but not go overboard. Who doesn’t love a treat or snack with a crumbly topping?! The crumbly topping pretty much just sits there calling my name until I devour it! Add a drizzle of date paste on top, and I’m in heaven. Just give me all the crumbly goodness already! 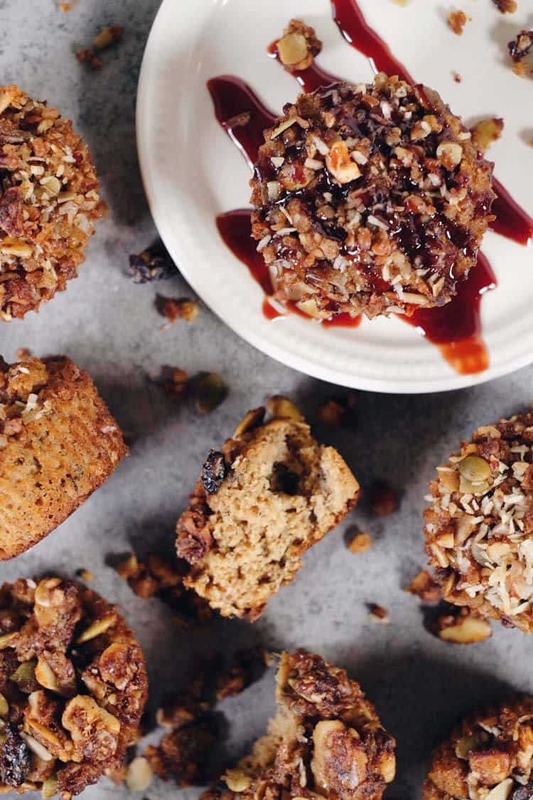 We use Paleonola granola to create the perfect crumbly topping for these banana nut muffins. It’s easy because it’s already made and takes out the extra step of making your own. Plus, they have so many flavors! You can choose the one that best suits your taste. My favorites for this recipe are Original, Pumpkin Pie and Maple Pancake. We love Paleonola because like us, they believe in real food made from simple ingredients. Partnering with Paleonola has been a really natural fit for us since we love and enjoy their products in our own home! We like adding a bit of granola to fresh fruit, to coconut milk, or just enjoying it by the handful for a snack! We also love the convenience of this ready-made, Paleo friendly granola. 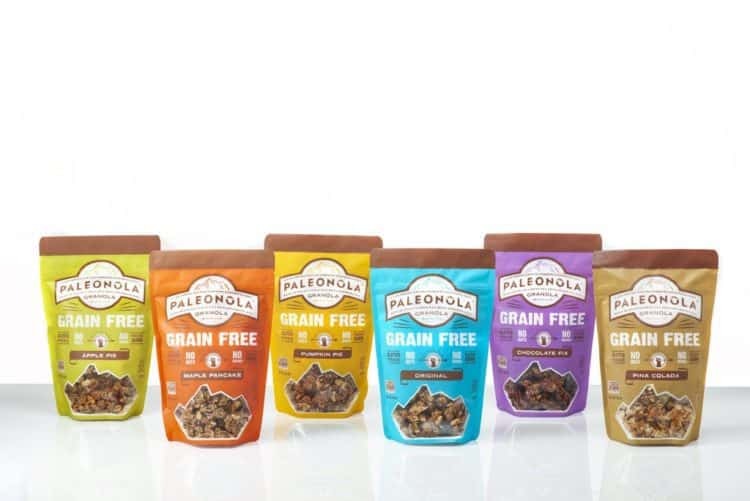 Paleonola has several flavors, and honestly we can’t decide which is our favorite. As part of our partnership, you can purchase Paleonola and receive a 20% discount using our special code at checkout: REALSIMPLE20. Check out the many flavors, and let us know which is your favorite! 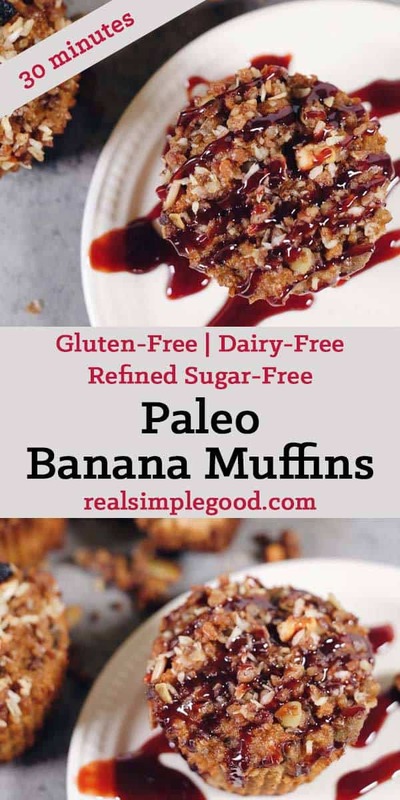 Getting back to these muffins, the base of these Paleo banana muffins is a super family and kid-friendly recipe that is quick and easy to make and has real food ingredients. We like using pretty ripe bananas (like the ones that have a little browning going on) to add a little extra sweetness, but you can also use just regular yellow bananas for a little less sweetness, too. 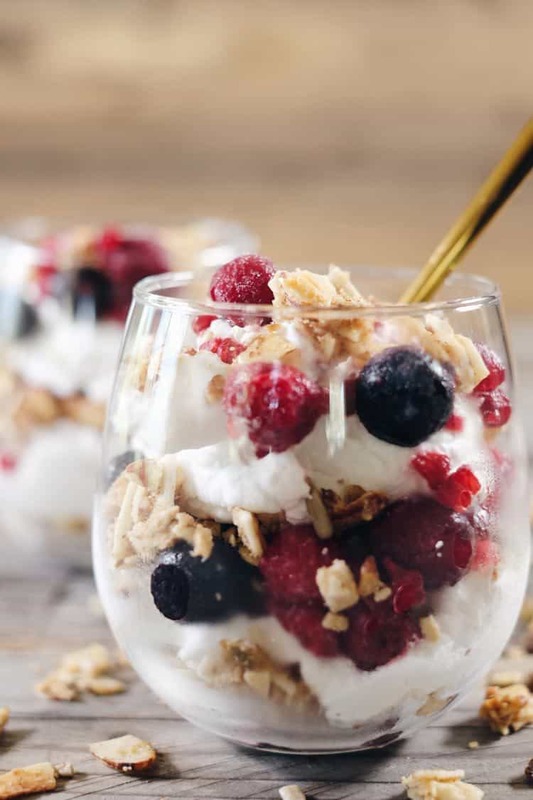 Another tasty and easy recipe we created using Paleonola granola is our Creamy Breakfast Parfait. It’s filled with healthy fats from the coconut whipped cream and antioxidants from the berries. 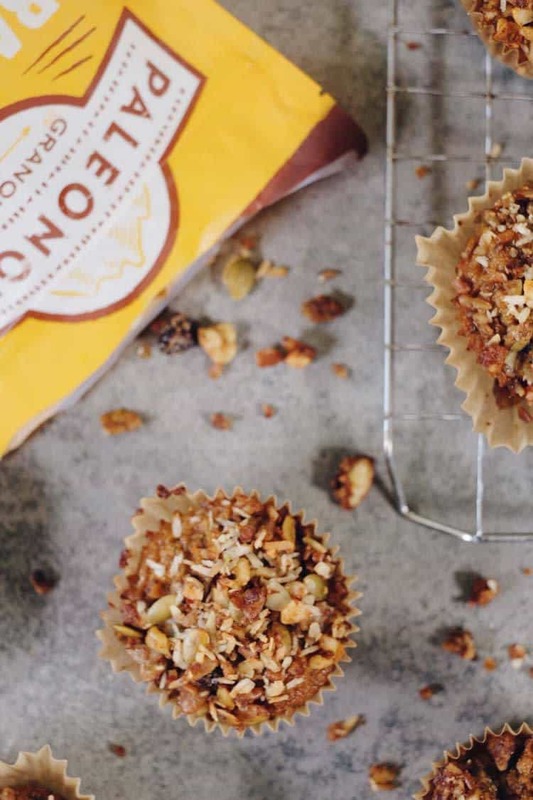 Go ahead and order some Paleonola granola to make these crumbly topped Paleo banana muffins. Let us know how it goes by leaving a comment below. Also, take a photo and tag us on Instagram @realsimplegood, so we can check it out! LIKE THIS RECIPE? PIN IT AND TRY IT LATER! 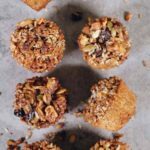 These Paleo banana muffins are sure to be a family favorite, and the perfect snack or breakfast! Preheat oven to 350° Fahrenheit and line a muffin tin with silicone or parchment liners. In a large mixing bowl, whisk the eggs and coconut sugar together. Add the vanilla and coconut oil or grassfed butter and mix until smooth. Stir in the mashed bananas until ingredients are combined. In a smaller mixing bowl, combine all of the dry ingredients (except for the granola). Slowly pour the dry ingredients into the bowl of wet ingredients and continue mixing until all of the ingredients are combined and mostly smooth. Pour the batter into the lined muffin tin so each muffin is about 2/3 full. 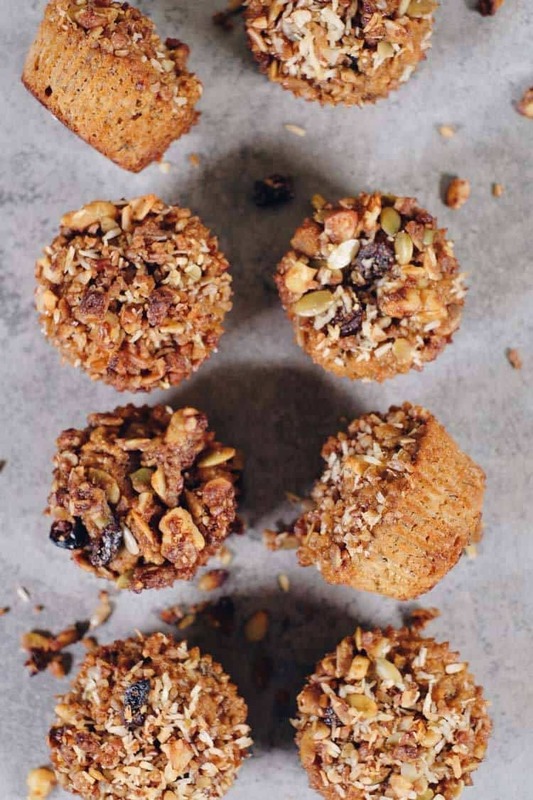 Sprinkle the granola on top of each muffin. Bake the muffins in the oven for 20 minutes. A toothpick will come out clean when they're ready. Once muffins are done, remove from oven and let cool. Once cool, drizzle a little date paste on top if you'd like or eat plain. Store in an airtight container at room temperature or in the fridge.